Illustrating interesting and unusual shells is what worldwideconchology.com is all about. Shell pictures help inspire, educate and further the science of conchology. This Web site will always be in a state of evolution as new images and features are added and old material updated. worldwideconchology.com is not a sales list. The illustrated shells are from private and museum collections and are made available for study and comparison. Our intention is not to illustrate every known molluscan species. There are many excellent conchology Web sites on the Internet that along with this Web site will provide a wealth of shell images and data for your conchological research and for inspiration to artists and graphic designers. In fact, the molluscan family pages on this site have integrated links to other relevant sites. The images that appear on worldwideconchology.com are selected mainly by what interests and inspires me during my own conchological research. And, like many of you, my interests sometimes wax and wan and this will be reflected in the images that are uploaded during any period of time. 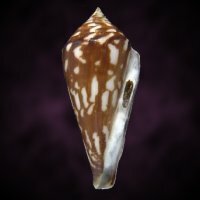 With the varied content on worldwideconchology.com, there should be something of interest to you. There are plenty of images and special features to explore. We hope you return again soon. Remember to add worldwideconchology.com to your bookmarks or I.E. Favorites. Enjoy your visit. 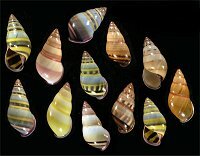 CONCHOLOGY - The Art and Science of Nature at worldwideconchology.com is a Web site designed for shell collectors with a variety of interests in the hobby and science of conchology, and for anyone who has ever been fascinated with the beauty and diversity of sea and land shells. We welcome you to enter the world of conchology. Is this species of land shell, Amphidromus adamsii, the epitome of natural selection, or just a wild joke by nature? This is one of many examples of the varied and brightly colored tropical land shells to be found throughout the world.